Thoughts on fishing, fatherhood, board games, technology, photography, video, cooking, gaming, and eternal issues. "Warning!!! FACEBOOK HAS CHANGED THEIR PRIVACY SETTINGS!" Have you ever received a phone call saying you just won a cruise? Got an email saying you won millions of pounds? Will get thousands of dollars for forwarding a message because you're helping some software company test tracking software? Have you ever been the victim of a practical joke? What follows this statement is a list of instructions of what they would like you to do to help them keep their privacy, and it MUST be done by you (sometimes upon threat of becoming an ex-friend)! They suddenly have no control over their account privacy settings because Facebook configured it that way. Ok, stop... Let's think about this a minute. Does Facebook really want to upset people like that? Hmm, they did force Timeline on us despite much outcry... Alright, maybe they could be that dumb... Back in our post, the last request is to copy said post and paste the message to your status and post it and the poster will be kind enough to help you out in the same way. Thanks, you're so kind! But then, you just followed the message, right? Facebook post settings - currently set to Public. This message is nothing more than a prank, except it targets your friends more than you. You see, it has nothing to do with your privacy settings... The only one that can control that is you using your post settings. The easiest way to do that is to set your post privacy setting next to the Post button, as seen in the image to the right. The drop down menu gives multiple options to control who can and can not see what you are about to post. Make it public, only for friends, only yourself (hey, some people like talking to themselves), and make it custom, location, or list based. 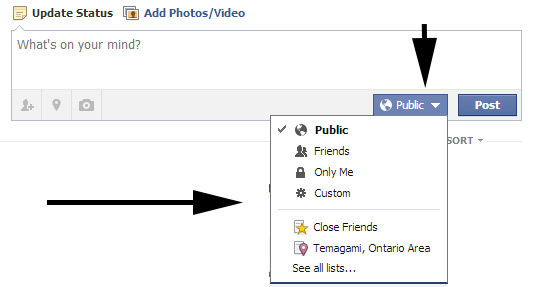 You can specify exactly who to post to in the custom setting, allowing you to post directly to a friend's wall. So, what wisdom does the warning impart to solve your privacy dilemma? Let's take a look. "PLEASE place your mouse over my name above (DO NOT CLICK), a window will appear, now move the mouse on “FRIENDS" (also without clicking), then down to "Settings", click here and a list will appear. REMOVE the CHECK on "LIFE EVENTS" and "COMMENTS & LIKES". By doing this, my activity among my friends and family will no longer become public." Ok, so let's take a look at what appears when you do this... If you look at the right, you'll see what you get when you hover over your friend's name in your timeline and then hover over the "Friends" button. The first menu is divided into 5 parts. The first one allows you to turn on notifications, just in case you really really want to know everything your friend says and can't bear to miss it... The second section is the one we are dealing with, controlling whether or not your friend's activity gets posted in your wall. The third allows you to add them to a list. The fourth allows you to review your interaction with said friend and suggest friends they might know. The last allows you to kick them to the curb. Sorry, ex-friend! Ok, so what does the "Settings' lead to? A big list with check marks. Remember now, this section deals with the topic of 'Showing in News Feed", so all these topics, from Life Events to Other Activity, and all the Games, Photos, Status Updates, and Comments and Likes in between all can potentially show up from this friend on your News Feed - you know, the big central thing with all the so and so did this and that, and here's a picture some people you know general stuff... So, what is the helpful post your friend made telling you to do? Uncheck Life Events and Comments and Likes (the posts can vary and ask you to uncheck different items from this list.) So let's think it though if you follow the directions... You've just told Facebook that you don't want to see various parts of the poster's activity. How does it help their privacy? Well, you won't see what they are doing in those areas, that's for sure! Is that what the poster is really intending? Now they want you to pass it on so all your friends do the same thing to you. I honestly doubt that you joined Facebook and got in touch with all your friends in order to tell them that you don't want them to see anything you're doing. This doesn't solve your bigger privacy issues if you are posting sensitive things to a "public" setting. Protect your privacy by posting things to your friends instead of publicly if you are concerned. Don't make sensitive comments on other people's PUBLIC posts. 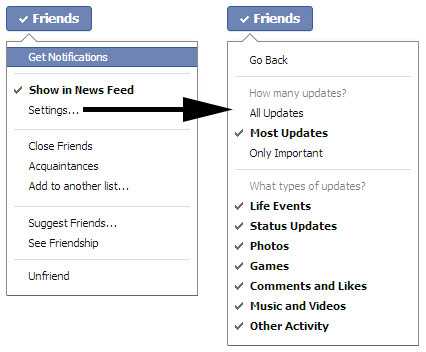 If you're really concerned, make a list of your close friends using the 'Close Friends' setting and only post to them. Please be courteous to others. All comments are monitored and comments containing degrading content or profanity will be deleted.